John Sayles has always been one of our most unique American storytellers whose tales of blue collar heroes fighting corruption at the hands of big business or greedy politicians (just to name two frequent bullies) along with the sincere depictions of American communities, ethnic and racial equality issues and interpersonal relationships have made some of his films cult classics. Despite being ignored at the box office which could have as much to do with the films' typical lack of availability at theatres as it does with the apathy of adrenaline seeking moviegoers, Sayles continues to quietly get his small epics made with amazing rosters of loyal actors such as casting Chris Cooper, Richard Dreyfuss, Danny Huston, Mary Kay Place, Tim Roth, Daryl Hannah, Michael Murphy, Billy Zane, Maria Bello, Kris Kristofferson and Thora Birch in his brilliantly funny political satire Silver City. 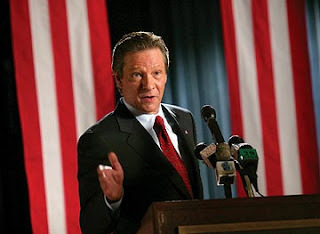 Set during a Colorado gubernatorial race, we first meet the thinly disguised President W clone Dickie Pilager (Chris Cooper) filming an environmental television spot wherein he accidentally casts his fishing reel too far and manages to hook a dead body. His manager and amoral handler Richard Dreyfuss hires former reporter turned private investigator Danny O’Brien (the likable Danny Huston) to look into the case. Once on the job, Danny turns to his paranoid internet journalist pal Tim Roth and Roth’s girl Friday Thora Birch for more information on the corruption behind the Pilager campaign and clues as to who may be sabotaging the candidate and Danny leaves with a plethora of suspects to track down that, of course, leads to even greater mystery and scandal. After the taut and pitch perfect setup, the film does grow a little more rambling in its middle section and could have benefited from sharper editing, Sayles followers are sure to delight in his quintessential blend of down home storytelling with cleverly written supporting roles (Cooper in particular is excellent), not to mention having a likable liberal underdog as our tour guide and this memorable work earned an award at the Political Film Society as well as a Golden Seashell nomination at the San Sebastian Film Festival. It's especially a great topical movie to track down now that we're all gearing up for Super Tuesday.